Welcome back to the First Monday Library Chat! In September, I moved across Philadelphia to join the Chemical Heritage Foundation (CHF) as their first Curator of Digital Collections. CHF is a Library, Museum, and Center for Scholars that uses the history of science and technology to understand the present and inform the future. Today I’m chatting with CHF’s Curator of Rare Books, Dr. James R. Voelkel. CHF has diverse collections: rare books, archives, oral histories, photographs, fine art, artifacts and instruments. Could you give us a general overview of CHF’s collections? CHF is the home of the Othmer Library of Chemical History, which collects rare and non-rare books on subjects relevant to the history of chemistry, and chemical industries broadly. We like to say that if it has to do with “stuff” we’re likely to be interested in it. For the rare book collection, this means that we collect books on chemistry, mining and metallurgy, dyeing, distilling, saltpeter and explosives, poisons, toxicology, wine and beer making, balneology (mineral springs) and so on. Our collection goes back to the 15th century, when the term “chymistry” was used interchangeably for chemistry and alchemy, so our collection of alchemical books is particularly strong. Our collections are probably stronger in 16th- and 17th-century chemistry than in 18th- and 19th-century. The rest of the library collections hold primary sources after 1850, secondary sources for history of science, and an extensive journal collection, especially strong in obscure chemical and chemical industry publications. Our archival collections hold important organizational papers (e.g. IUPAC—The International Union of Pure and Applied Chemistry), corporate papers (e.g. Rohm and Haas, and Dow), and papers of notable individual chemists, including several Nobel prize winners (e.g. Paul Flory). The image archive also has over 20,000 images of chemists and chemical sites. The fine art collection has a very large collection of paintings of alchemical scenes, a large number of them 17th-century Dutch genre paintings. Altogether it has more than 90 paintings and 200 works on paper. Finally, the artifacts and instrument collections are so large they can not all be stored in the building. We have chemical glassware, large analytical instruments like mass spectrometers and chromatographs, and a very large collection of chemistry sets. We also have objects illustrating chemistry in every day life, like Bakelite objects, synthetic dresses, and numerous ephemeral objects like advertisements. Within the Rare Book Collection that you oversee, could you identify some items that might interest researchers working with historical recipes or books of secrets? We have a number of books of secrets and a large collection of works by Kenelm Digby, including his Choice and experimented receipts in physick and chirurgery (London, 1668). We have numerous books in culinary history, from Denis Papin’s A New Digester or Engine for Softning Bones (London, 1681)—the first book on the pressure cooker—to Friedrich Accum’s Culinary chemistry (London, 1821). For the nefarious, we can also supply Accum’s A Treatise on Adulterations of Food, and Culinary Poisons (London, 1820). Fireworks books often have numerous recipes for explosives and different color flames. J. C. Stövesandt, Deutliche Anweisung zur Feuerwerkerey (Halle: J.J. Gebauern, 1748) has many pages of recipes in relatively modern-looking form. Going further back, the Vollenkommene Unterweisung/ wie Raketen/ Feuer- Wasser- Sturm-Kugeln/ Granaten/ Pech-Sturm-Kräntze/ und allerhand Lust nnd Ernsthaffte Feuer-wercke zubereiten (Osnabrück, 1660) has recipes and 50 instructive plates. CHF recently purchased ten alchemical manuscripts, primarily dating from the fifteenth century. Do any of these manuscripts have recipes in them? The oldest book of secrets we own is a manuscript from 1438 entitled “[Liber de] Secreti naturali”. It has more than 500 recipes ranging from metallurgy to cosmetics to veterinary cures, and a beautiful binding with 437 decorative nails forming a star with a circle. Many of the manuscripts are more theoretical in nature, like the three different Pseudo-Lullian works or Petrus Bonus’s Pretiosa margarita novella. But the youngest of the manuscripts, a French copy of Pseudo-Arnaldus of Villanova, Le petit rosaire has numerous descriptions with rather nice drawings of laboratory set-ups, which I believe must also include the ingredients. Liber secreti naturali (Northwestern Italy, ca. 1438), Othmer MS 1. I understand that these manuscripts will be included in CHF’s forthcoming exhibition “Books of Secrets: Writing and Reading Alchemy”, which runs from Dec. 5, 2014 till Sept. 4, 2015. Can you tell us more about the new exhibition? 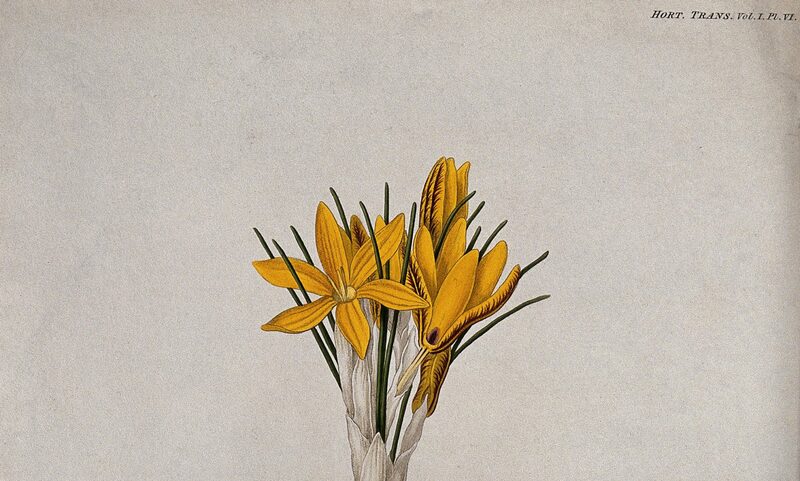 The exhibition, which I co-curated with CHF’s Curator of Fine Art, Amanda Shields, came about from the desire to showcase two of CHF’s holdings: the newly acquired alchemical manuscripts, and a number of paintings from our collection. The theme that links the manuscripts and the paintings is the centrality of the written word in alchemical practice. Though one might think that the activity of the alchemist was focused on the laboratory and the furnace, in fact, alchemists spent a large amount of time writing and reading. Alchemy was paradoxically both public and secret. Since it was nominally secret but alchemists still desired to communicate, they used code words and strange allegories to describe their processes. When we started going through the collection, we discovered that almost all alchemical paintings have books or manuscripts somewhere in the frame. Very often the alchemist is deeply involved in pouring over manuscripts, and the furnace smokes remain neglected in the background. The books themselves also show evidence of hard-reading. 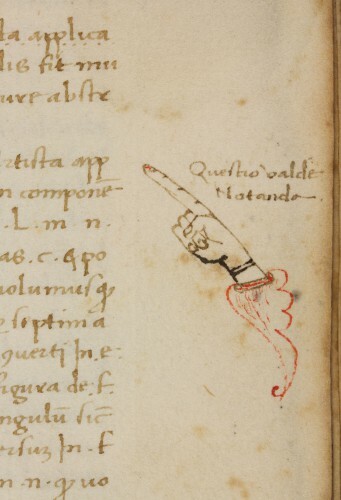 They are dotted with reading notes and manicules (those little pointing hands readers have used for centuries to highlight text). One of them is even coated in soot, as though it had been held by the crucible-stirrer in the painting. It really is a wonderful synergy to exhibit the artifact alongside the depiction of that artifact in use. It really gets at the materiality of the practice of reading in a way that could not be accomplished with either the manuscripts or the paintings alone. To take the visitor through that arc, the exhibition is divided into three sections. First, there is a section on the writing of manuscripts, on the paper, ink, and techniques used to get the words on paper. 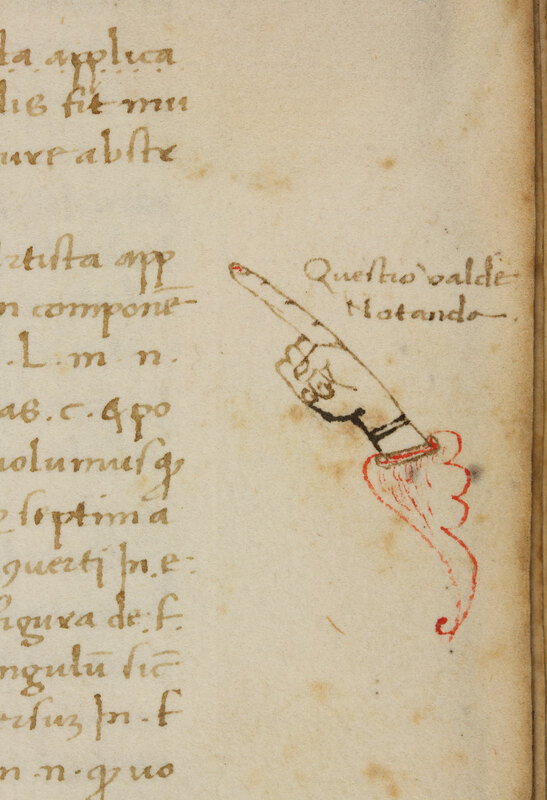 Then there is a section on the use of manuscripts, on reading and note taking. 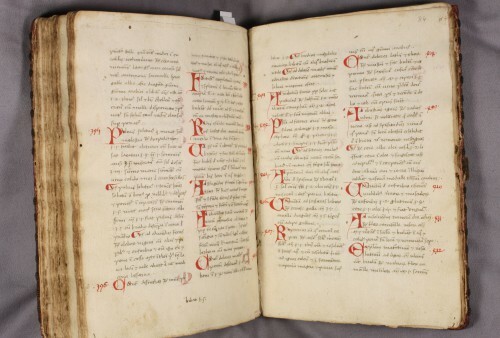 Finally, there is a section on the continuity of manuscripts and print, noting the similarities between the manuscripts and some of CHF’s earliest printed books. Is there a fellowship program that would allow researchers to visit CHF and use the collections? CHF has a variety of programs to support the use of our collections. The Beckman Center for the History of Chemistry at CHF offers academic year (9 month) and short term (1-4 month) fellowships for researchers, post-docs and dissertation-writing Ph.D. students. The Beckman Center also offers 1-2 week travel grants for researchers needing to see specific items in our collections.Though these are used primarily for library and archival collections, they can also be used for study of our art and artifacts collections. Sometimes, scholars who are thinking of applying for a longer term fellowship use a travel grant to scout our collections, which is certainly helpful. Thanks, Jim, for chatting with me! The CHF Museum is free and open to the public Monday through Friday from 10am to 5pm. The Library’s Reading Room is open Monday through Friday from 10am to 4pm, but is accessible by appointment only. Thanks for sharing. Great element in the images. Keep up the dedicated work.